When I was preparing the lesson on Clothes I knew that at the same time the elementary students will have to learn the present continuous tense. And as I had a little time to spare I prepared the following activities for them to learn this grammar point. Once again I present the tense using the following mind map where I try to explain the form and basic usage of the tense. Now that you know the theory it is time to use it in the games. The first two games – Penalty and Hoopshot – test your knowledge of the form and of the usage of the present continuous tense. The third game test your ability to form the verbs with -ing ending in the correct way. Present continuous tense – penalty game. Present continuous tense – hoop shoot game. Verbs with -ing ending – teacher invaders game. If you are an elementary student trying to learn English the following games and mind maps might be useful for you. As I mentioned above our previous post deals with CLOTHES and can find there a video, mind map and four games to practise this vocabulary set. Then you should certainly try our post dealing with past simple tense. 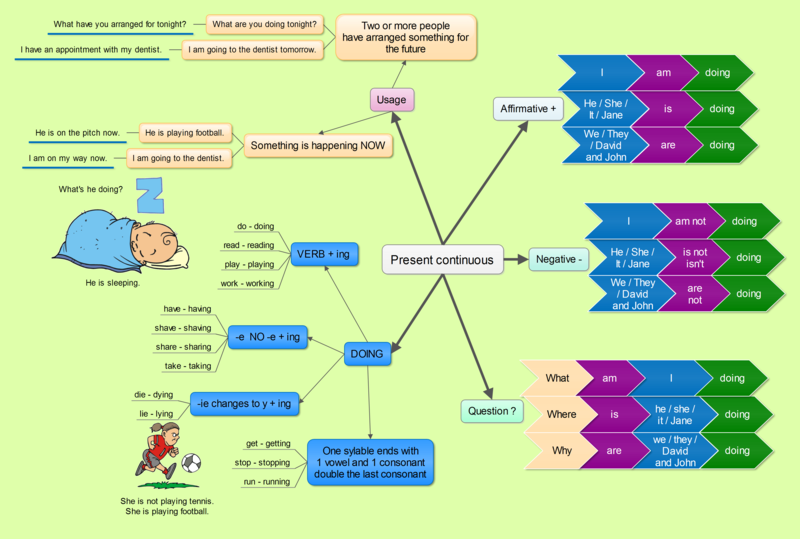 There is a mind map explaining the usage and form of the past simple tense. Moreover, there are several games where you can learn the past forms of irregular verbs. So, do not hesitate and try our Past simple post. If you think that you need to learn or practise more vocabulary, there is a post dealing with food. There is a mind map with the pictures of different kinds of food and then there are games where you can practise what you have learnt. I would like that good information about (to&for),and method the teacher is good.thank you. did you build the mind map? Great job! Nice, but note that it’s “practice”, not “practise” (used three times, so definitely not a typing issue!). Practise is a verb and practice is a noun in British English (the variety I tend to use) In American English it is always practice. Seems , really spent time in doing this. I would love that. Go on. Do you use that mind map to explain the tense and put on the classroom wall or do you also give a copy of the mind map to your students so they can have it in their notebooks? I give the copy to the students too. I think they need it to understand it better. Of course, I prefer printing it out in colour but that is expensive. Thank you very much & Thanks for sharing. Very useful.